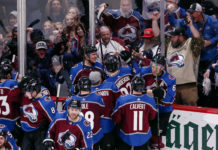 While the NHL playoffs rage on in North America, nations continue to do battle in Russia, with the World Championship having just wrapped up its preliminary round. The bottom half of the standings, following the round-robin portion, have been eliminated. Only the top 10 nations remain, as the competition heads into the quarterfinals. An alternate captain for Canada, Matt Duchene got off to a torrid start in the tournament. His production has since tapered off, yet he still has four goals and eight points in just seven games. Canada’s production has tapered off as well, as they lost their first game of the tournament when they were shut out 4-0 by Finland in their final preliminary round game, costing them the top seed in Group A.
Goaltender Calvin Pickard is representing Canada as well, having appeared in two contests. When he has gotten the call, he has been lights out. 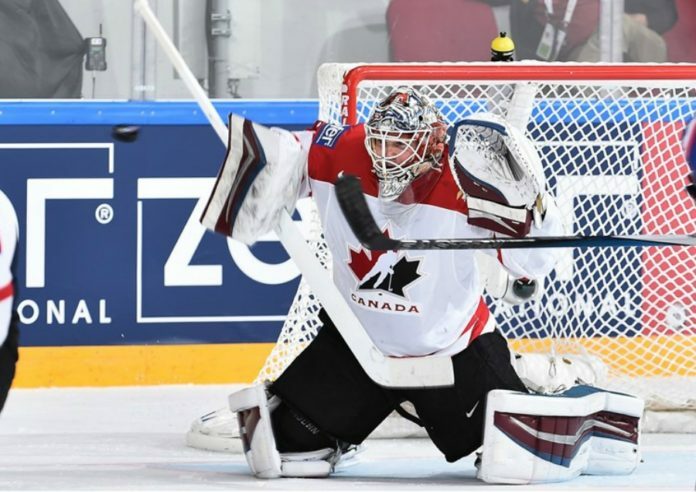 In his two games, he has only surrendered one goal (he posted a shutout against France in his last action), posting a goals against average of 0.50 and a save percentage of .971. Luckily for him, he was not in net for the loss to Finland. Goaltender Reto Berra’s tournament is now over, as Switzerland failed to qualify for the elimination round. The Swiss were close in most games (losing three games in overtime), but were only able to muster one overtime win and one victory in regulation. Berra played all but one of his team’s seven games, posting a goals against average of 3.39 and a save percentage of .881. Norway finished a single regulation win away from making the elimination round, but alas, their tournament has also come to an end. Andreas Martinsen played decently in his seven games, netting two goals (including an overtime winner) and three points. Finland finished the prelims as the tournament’s top overall seed thanks to the victory over Canada. Mikko Rantanen was finally able to crack the lineup for the final two round-robin games, netting one assist; he was also plus-2. Team USA squeaked into the elimination round after finishing fourth in Group B. Avalanche prospect J.T. 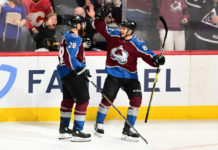 Compher has been playing on the team’s checking line. In his seven games, he has one goal and two points. 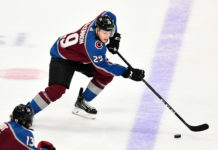 Finally, Avalanche defensive prospect Anton Lindholm and Sweden will also advance to the elimination round, having secured the third seed in Group A. Lindholm has gone pointless in the two games he managed to get into, with a minus-1 rating. Sweden will face off against Canada in the quarterfinals, the United States will play the Czech Republic, while Finland will play Denmark. In the other matchup (the one that will not contain an Ave), Germany will take on Russia. All of the matchups will take place on Thursday.